* The file name or path does not exist. * The file is being used by another program. * The workbook you are trying to save has the same name as a currently open workbook. Excel found unreadable content in 'Tableau 7.xlam'. Do you want to recover the contents of this workbook? If you trust the source of this workbook, click Yes. Your office installation probably lacks vba-support. This was probably removed during installation. When leaving the office-setting to default it will get installed. A reason for disabling could be for security concerns. To install it, you have to run the office-setup and click on "Add or Remove Features". 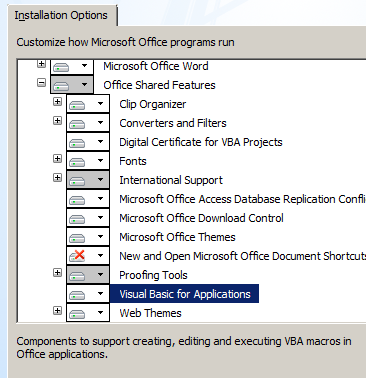 Then select "Office Shared Features">"Visual Basic for Applications". Like depicted in the screenshots. Also I want to link the article which finally pointed me in the right direction here. In the end, I would feel incomplete, if my last words weren't something about how misleading and uninformative those error messages were. Especially the first one which gives me 3 bullet-points. But because I don't want to spend further time with it, I keep anything witty to say for me and let it be.